This infographic shows how culture is superior to strategy. Only strategies which are aligned to a culture will be implemented. Strategies which are going against a culture will never be implemente, no matter how hard you try. Organizational Change faces a lot of barriers. however the biggest obstacles are the invisible barriers which are embedded in the culture of an organization. Being aware and tackling those invisible barriers is paramount in successful organizationbal change. 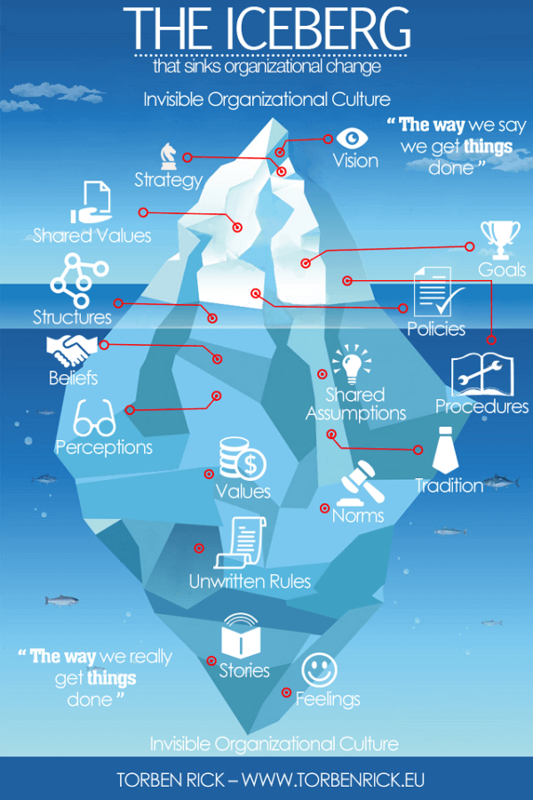 The infographic below is a great visual of the unvisible barriers to change. Culture Change starts at the top. This article describes how failure in seclecting the right people at the top of an organization and admitting it can be a trigger for culture change. When it comes to people-development management of many SMEs think that they cannot afford such investment. However, they should think twice. People-development is a crucial element in developing competitive advantages which last and is indispensible. People-development done right and with strategic importance will create benefits moving the company ahead of the crowd, even ahead of the big companies. The article provides a basis for discussion to enable SMEs to tackle importance of people-development and to start learning quicker than the competition. In February, I am providing you with an overview how new leadership positions can support the development of managers who are considered as talent in your organisation. Especially when a new position has elements of stretch-assignments, it has the the capacity to support further development. The linking of selecting the right candidate with his/her development in a work based environment give you the opportunity to select those candidates who are considered for going places and have them proving themselves on their way up. This month, I want to provide you with some transparency for successful succession plan and development processes and what successful companies differ from less-successful companies. There are different approaches out there to ensure that a company has the right people at the right time available to fill its senior positions. Applying a strategic and systematic approach and dealing openly with the risks and problems such an approach might have, increases the chances of higher returns of such an investment and for developing a sustainable competitive advantage. It’s a competitive advantage if you are seen by your customers for what you and your company stand for. The best way to achieve this is to have your superior customer value reflected in your employees' behaviour. In December, I am referring you to the work of Ulrich and Smalwood who with their work in Strategic Human Resources have created a new level for value creation through people management. To get started in developing a Leadership Brand, forget the generic approaches of leadership training. It's all about your company and its specific culture. Something you cannot buy off the shelve. You can lay a basis for your further work to use the tool for Leadership Brand Assessment. Going from there you could develop your competitive advantages with a lasting copy protection. Where Is Your Company in Talent Management? This month, I am providing you a short check on talent management in your company. Having the right people at the right place at the right time and managing your talent accordingly might be the only sustainable competitive advantage you can develop with a long-term copy protection. But having the right processes in place is not enough. It is the degree of passion of different stakeholder groups what makes the difference. Make a short check about your company's talent management capabilitiy and do something about it if you believe that at the end it's the people who matter most.